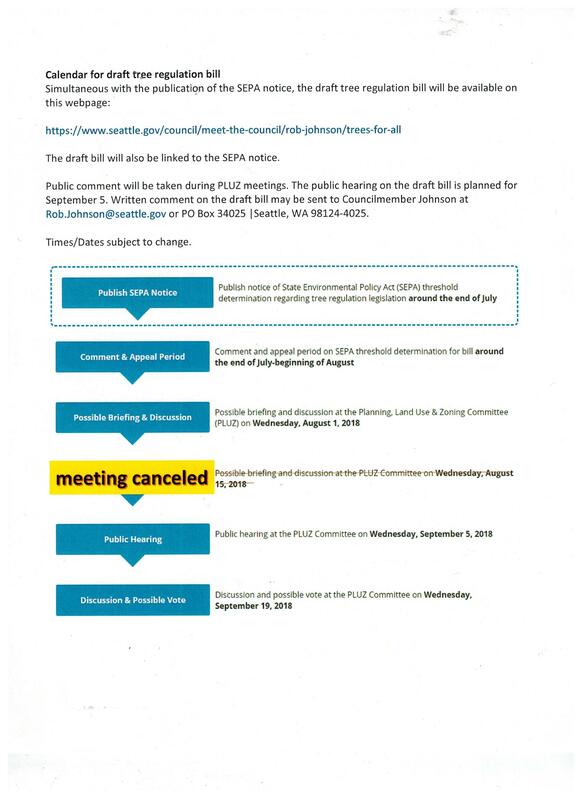 Current timeline according to Councilmember Rob Johnson is to release a draft ordinance by the end of July, complete a SEPA analysis in August, have public hearings in August and possibly a vote by Sept 15th. Note all Coalition meetings are open to anyone who wants to attend, your support is needed for us to be successful. We welcome your help. Councilmember Johnson is trying to get this passed by August, the same timeline he is working on for the MHA upzone legislation. Johnson in his memo from Council staff, however, proposes exempting developers from having to get permits to remove trees and replace them on site or pay the city to do so elsewhere. He also supports a 12″ threshold DBH rather than 6 ” DBH which would cover 45% of the trees on single family lots. Remove the exemption of lots less than 5000 sq ft from complying with the current Tree Protection Ordinance.